I told the Lord that I was tired and scared and even unwilling and asked that He would just be gentle with me in this pregnancy and labor. He very lovingly cared for me during the pregnancy, slowly teaching my heart to trust Him again – but that’s another story. So my due date came and that evening signs of labor started up. We called the midwife but things slowed after a few hours with little progress. Baby’s position was off and I was discouraged. I could go to the chiropractor again, do more positioning stretches (had been doing them for the last 6 weeks) and maybe the baby’s position would change. This sounded long and drawn out and the false start had used up all my psyche. Between 3 and 4 AM we discussed other options. Brian’s Dad is an OB in East Texas. 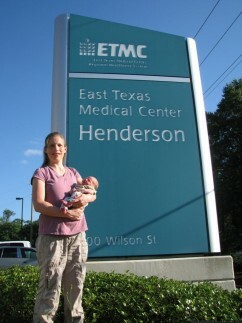 We figured this was our best bet since we would be a no-doc patient here in town. Brian called his Dad and he said to come on. This change in plans was hard for Brian because of the bad experience we had with hospitals when Lance was born, but he loved me enough to “risk” it. At this point labor was slow and not uncomfortable so we decided to make the drive. We arrived at the hospital and I was hooked up. 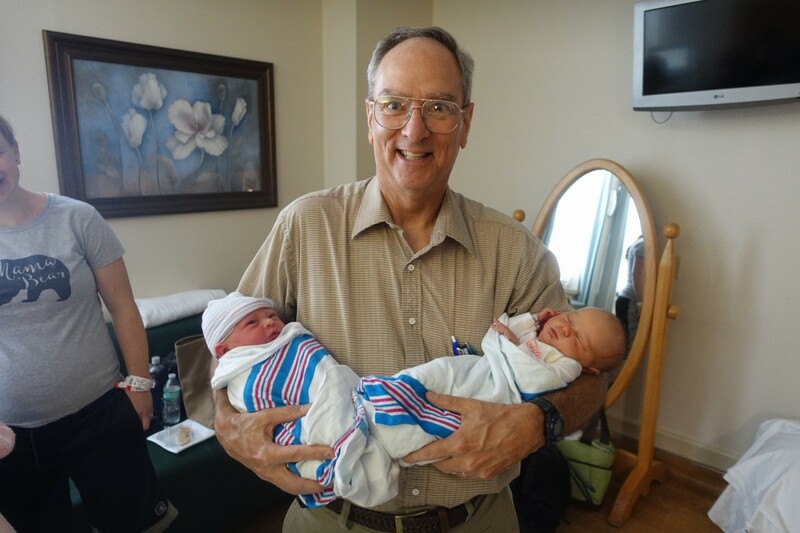 Two days earlier “Papa Doc” had delivered grandchild #15 via c-section. Brian’s brother and sister-in-law were still at the hospital so they, along with Brian’s parents were able to keep us company as I waited on my body to work. After a slow start, things picked up around 4 that afternoon. Brian’s Dad suited up around 5:30 and they discussed the church business meeting while I went through the last stages of labor – wonderfully void of pain, thanks to an epidural. 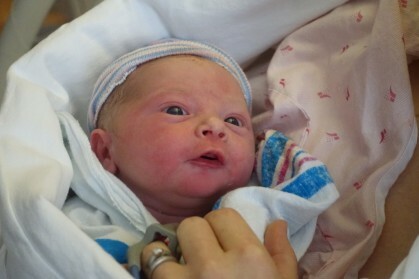 At 6:00 PM, June 20, little Ryder came into the world! Having felt every moment of my previous births, the whole thing was quite unusual in that I felt nothing except a strange numbness in my legs. 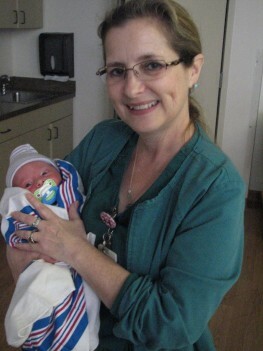 In a very different way than I had imagined, God answered my prayer for a gentle birth. Papa Doc with his two grandchildren! Nurse Helen who was patient and encouraging when things seemed long. Everything over and done – time to rejoice with family! An unexpected benefit of the epidural was that it wiped out all my after-birth pains too – which are quite severe for me – so I could actually enjoy the “showing off” of the new baby. 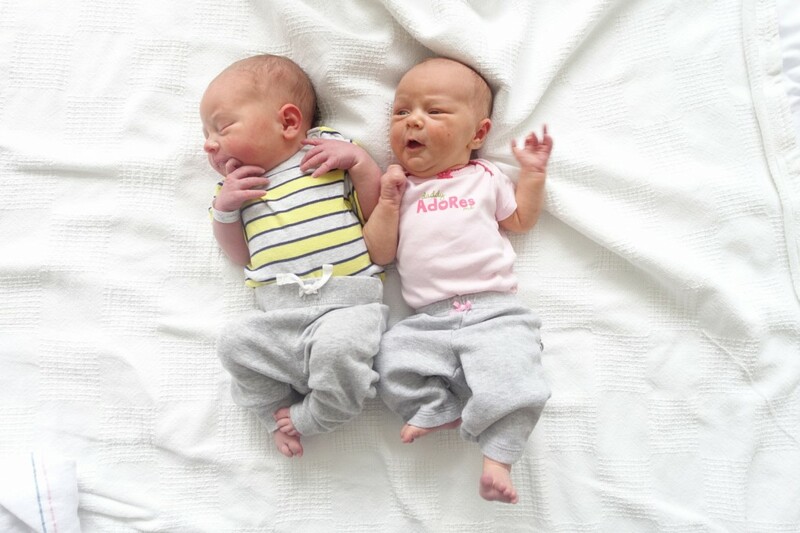 Cousins – Ryder and Cherish; 1 day and 3 days old. They were the same length and within a few ounces of each other. Cherish will get to tell Ryder that she attended his birth…asleep in a little baby bed. The experience at the hospital was wonderful. The staff were great, we didn’t feel like pawns in the system and many things were similar to the way I liked it at home. I enjoyed the epidural and was much relieved to be spared the pain this time around. We had a quiet day of recovery then headed home to show the kids their new baby brother! The drive home gave us time to process the entire event. I feel great and I am super glad to have it all behind me. Cannot tell you how much our prayers were the same for you for this birth. 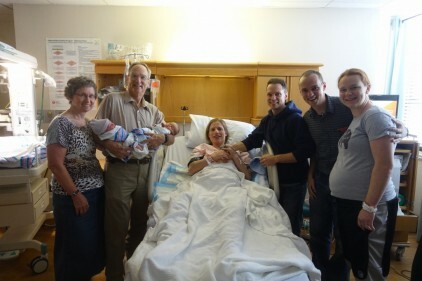 I am so grateful that God provided through Papa Doc and that he got to participate in this birth!